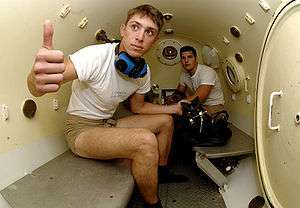 A recompression chamber is used to treat some diving disorders, and for training divers to recognise the symptoms. This course has been presented since 1977, and has been influenced by internationally accepted training objectives recommended by the Diving Medical Advisory Committee, the European Diving Technology Committee, and the European Committee for Hyperbaric Medicine. The course is designed for qualified medical practitioners, but may be useful to others who work in the field of diving safety and operations. The standard drawn up jointly by the European Committee for Hyperbaric Medicine and the European Diving Technical Committee defines job descriptions for several levels of diving and hyperbaric physician: Education and assessment to these standards may be provided by institutions of higher education under the leadership of a Level 3 Hyperbaric Medicine Expert as defined below. Certificates of competence may be issued by a nationally accredited institution or an internationally acknowledged agency, and periodic recertification is required. Level 1. Medical Examiner of Divers (MED) minimum 28 teaching hours. German standards for education and assessment of diving medical practitioners are similar to the ECHM-EDTC Standards and are controlled by the Gesellschaft für Tauch- und Überdruckmedizin e. V.. They include Medical Examiner of Divers, Diving Medicine Physician, Hyperbaric Medicine Physician, Chief Hyperbaric Medicine Physician and Hyperbaric Medicine Consultant. A diver medic is a member of a dive team who is trained in advanced first aid. A Diver Medic recognised by IMCA must be capable of administering First Aid and emergency treatment, and carrying out the directions of a doctor pending the arrival of more skilled medical aid, and therefore must be able to effectively communicate with a doctor who is not on site, and be familiar with diving procedures and compression chamber operation. The Diver Medic must also be able to assist the diving supervisor with decompression procedures provide advice as to when more specialised medical help should be requested, and must be fit to provide treatment in a hyperbaric chamber in an emergency, and must therefore hold a valid certificate of medical fitness to dive. The ECHM is an organisation to study and define indications for hyperbaric therapy, research and therapy protocols, standards for therapeutic and technical procedures, equipment and personnel, and related cost-benefit and cost-effectiveness criteria. It is a representative body with the European health authorities, and works toward cooperation among scientific organizations involved in the field of Diving and Hyperbaric Medicine. Membership of the committee includes doctors practicing diving medicine in Northern Europe, representatives of relevant health authorities, medical representatives from relevant navies, and a diving safety officer nominated by the International Marine Contractors Association. ↑ Vann, Richard D (2007). Moon RE, Piantadosi CA, Camporesi EM, eds. "The History of Divers Alert Network (DAN) and DAN Research.". Dr. Peter Bennett Symposium Proceedings. Held May 1, 2004. Durham, N.C.:. Divers Alert Network. Retrieved 2014-02-11. ↑ Elliott, David (2011). "The foundations for today's future.". Diving Hyperb Med. 41 (3): 118–20. PMID 21948494. Retrieved 2014-02-11. ↑ "Diver Medic Technician Resource Manual". NBDHMT. Retrieved 2009-06-14. ↑ "Certified Hyperbaric Technician Resource Manual". NBDHMT. Retrieved 2009-06-14. ↑ Knight, John (1996). "Twenty five years of SPUMS 1971-1996.". South Pacific Underwater Medicine Society Journal. 26 (2). ISSN 0813-1988. OCLC 16986801. Retrieved 2008-06-16.